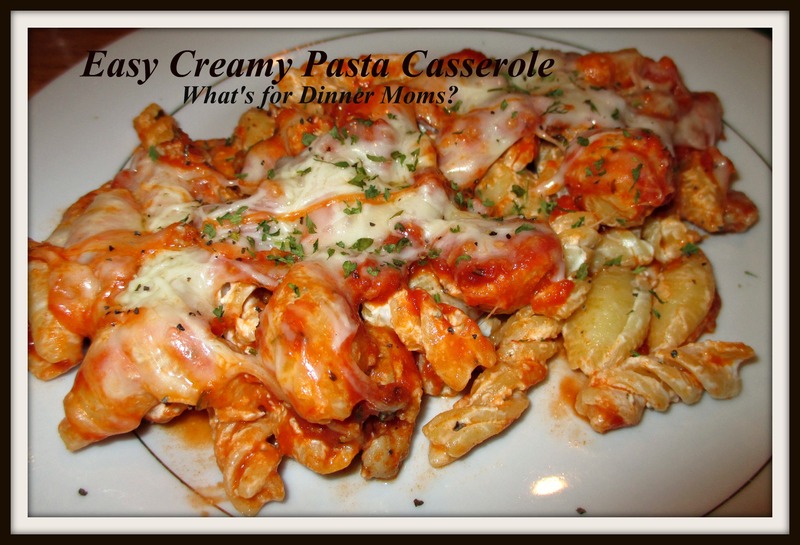 Easy Creamy Pasta Casserole – What's for Dinner Moms? Trying to use up all the last pieces and parts that I am finding in my refrigerator, freezer and pantry is going to be interesting. I am working on a No-Buy June where I have to use up what is in my pantry, freezer and refrigerator. I can buy fresh produce, dairy and spices but will try to buy little to no groceries for the rest of the month. I have several boxes of pasta that are 1/3 to 1/2 full. Of course nothing matches. There are shells, fusilli, rotini…. 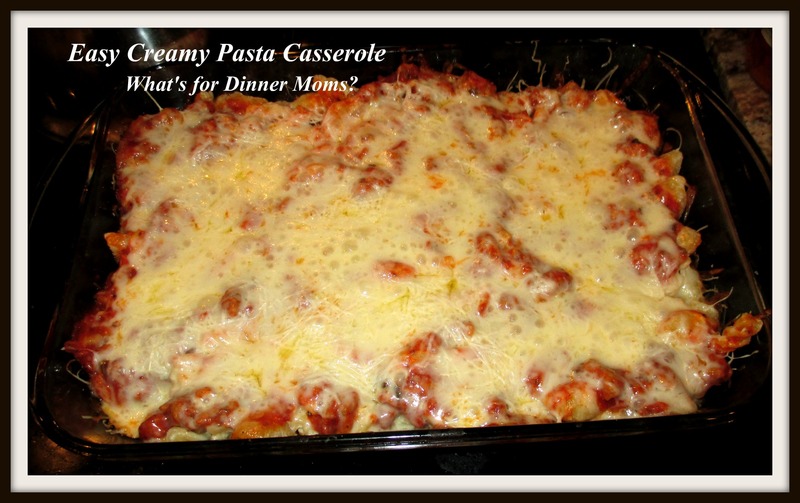 So, I decided to at least use up some of them for dinner the other night by combining them into a casserole. I served pasta to my family two nights in a row. I thought my son was going to lose his mind. He couldn’t believe that we would have pasta as a main entrée twice in a week let alone two days in a row. But, once he tasted the casserole he was fine. He even took a serving for school the next day. For my mostly gluten-free son I made him a separate casserole dish with gluten-free pasta and halved all the ingredients. This left him with plenty of leftovers. I served this with a green side salad and a side of steamed broccoli. Preheat oven to 350 degrees. Spray a 13 x 9 pan with non-stick spray. Boil pasta according to package directions to al dente. If you wish to add meat to your dish brown the meat while the pasta is cooking breaking it up in small pieces as it cooks. When the meat is completely cooked drain off all the fat. Add the jar of sauce to the meat and any additional spices you wish. Drain pasta when cooked and return pasta back to pan. Add cream cheese and powdered garlic to the hot pasta and stir until the cream cheese is completely melted. Add about 1/2 cup of sauce to the bottom of the prepared pan and spread it around to cover the bottom. Add the pasta to the pan and spread evenly. Pour the remaining sauce over the top of the pasta and spread evenly. Sprinkle all the cheese over the top of the dish. Bake for 30-35 minutes until cheese is bubbly and starting to brown around the edges.